“Something borrowed, something blue, something old something new”. We all know the saying but when it comes down to it, it is not so easy to think of stylish ways to incorporate each one into your wedding. We asked some of our customers which they thought was the hardest to add to a wedding effortlessly and ‘something blue’ was a clear winner. So, we have come up with some ideas for something blue which allow you to carry on the tradition with a classy modern twist. 1 – Blue dress: You can ditch the traditional white gown for an eye catching, spring inspired blue wedding dress. This eye-catching dress from Kathryn Hopkins is not only edgy but also elegant. Photography, Styling, & Gown: Kathryn Hopkins Photography. 2 – Blue wedding stationary: Nobody said the old school rhyme had to go in order, so why not start the journey using blue. 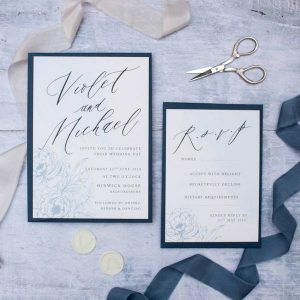 A pop of colour always looks great on wedding stationary. Wedding invitations by Nina Thomas Studio. 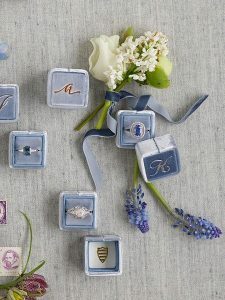 3 – Blue ring box: A pretty essential for a perfect ring. Blue velvet ring boxes have a way of adding a classic vintage touch. You can also make it personal by personalising it with a custom monogram. Box by The Mrs Box. 4 – Blue robes: This has to be one of the favourites as it involves the girlies too! 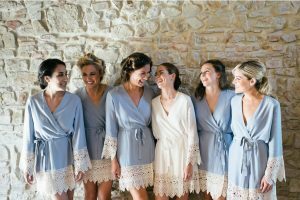 Bridesmaid robes are perfect for the morning of the wedding and it looks lovely in the pictures. They can also be presented your bridal party along with other cute items in a gift box. 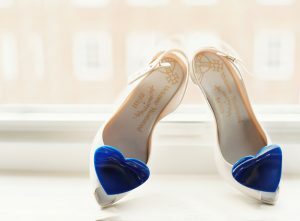 5 – Blue shoes: If you don’t want to go all the way with blue shoes, you can just have a hint of blue. Remember that your comfort is the most important thing! 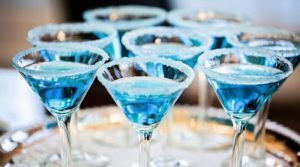 6- Blue cocktails: Make sure everyone is letting their hair down with signature blue cocktails. They not only look fancy but should also get everyone out of their seats and on to the dance floor! I’d love to know if you have any ideas on how to incorporate ‘something blue’ into a wedding.